The dazzling Pink and White Terraces on the shores of Lake Rotomahana at one time were the greatest national treasure of New Zealand. They were cherished by the Maori and known far and wide as the eighth natural wonder of the world. Then, during an immense volcanic eruption in 1886, they disappeared. The terraces formed when a magma chamber heated groundwater and sent it spurting out of the ground, carrying dissolved minerals that rapidly crystallized when the water contacted the much cooler air. The same geothermal process creates the geysers and mineral formations at Yellowstone National Park. At the White Terraces, scalding, silica-laden water burbled from a crater about 100 feet above the lake and cascaded down about 50 wide scalloped steps. As the water cooled, silica precipitated out of solution, dribbling over the steps and creating formations that looked like candle wax. The White Terraces covered an area equivalent to seven football fields. The Pink Terraces, about half a mile across the lake from the Whites, were smaller but still impressive. The colors of the formations probably arose from differences in mineral composition or microbial populations in their waters. To the Te Arawa, the Maori tribe with ancestral rights to the lake and its surroundings, the White Terraces—or Te Tarata, “the tattooed rock”—were male. The Pinks—or Otukapuarangi, “fountain of the clouded sky”—were female. The terraces also had great commercial value to the Te Arawa, who controlled access to them, provided canoe transport, and ran a small hotel nearby. Despite their remoteness, the terraces became a popular destination in the 1800s for wealthy European and American travelers with a taste for adventure—and considerable stamina. A trip to the terraces started with an ocean voyage of weeks or months just to reach New Zealand. It continued with a 150-mile coach ride from Auckland to Rotorua, a 15-mile hike through the bush, a 7-mile boat ride across Lake Tarawera, and finally a canoe ride on Lake Rotomahana. 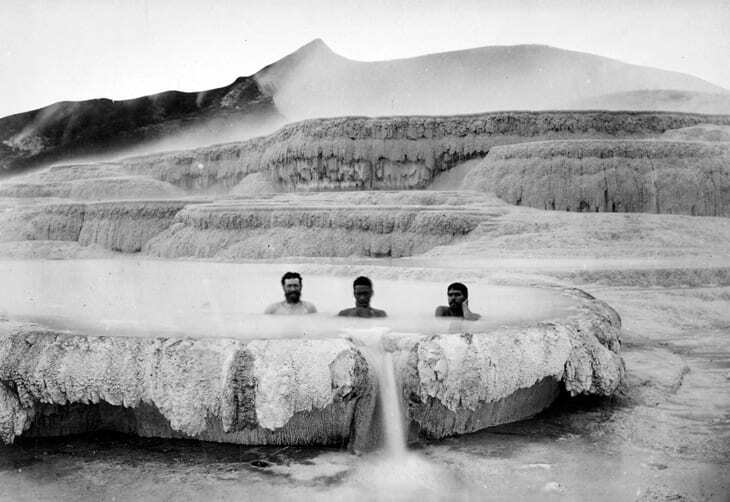 At journey’s end, travelers enjoyed long soaks in the terraces’ warm waters. Tourists and locals alike used to clamber up and down the terraces looking for pools with just the right temperature to bathe in. One feature not visible in old photographs and paintings of the terraces was the softness of the pool walls, caused by incomplete crystallization of the silica. Among the visitors surprised by their spongy texture was English novelist Anthony Trollope. The eruption started just after midnight on June 10, 1886. It didn’t just blow the top off a single peak. A series of eruptions went on for hours and opened a rift more than ten miles long—right through the lake floor and beyond. “It started at Mount Tarawera, and it went northeast first and then it kind of turned around and went southwest and unzipped underneath the old Lake Rotomahana,” said de Ronde. That’s when it turned most deadly. When the superhot magma hit the cool lake water and water-saturated ground, it caused a massive steam explosion that opened a crater several times the size of the lake and hurled tons of lakefloor sediment for miles around. The Te Arawa who survived had little left but their lives. 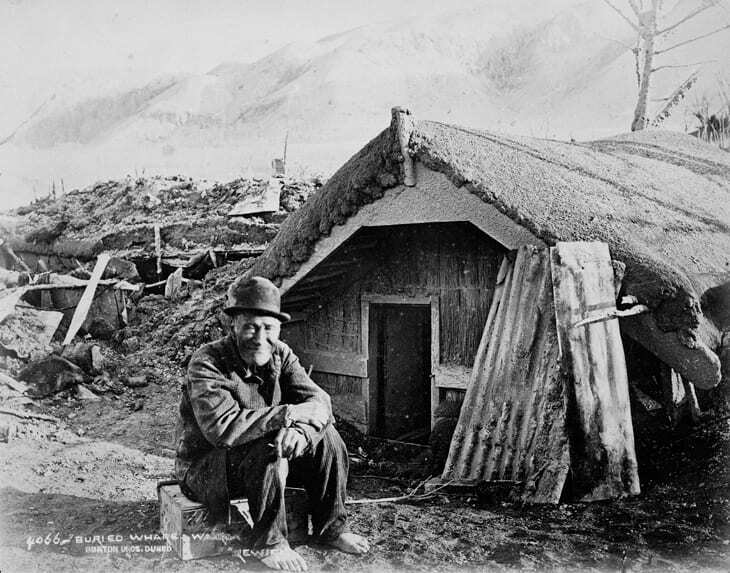 The entire tribe dispersed, some moving up to 200 miles away and most having to ask permission to live on other tribes’ land. The terraces had disappeared, but it was impossible to say what exactly had happened to them. A surveying party sent to assess the damage faced an impossible task, said de Ronde. But even then, he said, a few observers suggested that the terraces might not have been destroyed; that they might still be there, under the mud. Debris thrown out by the eruption blocked the stream that had drained the old Lake Rotomahana, so as water continued to flow in, the crater began to fill up. Within 15 years of the eruption, a new lake had formed, drowning the area where the terraces had been. 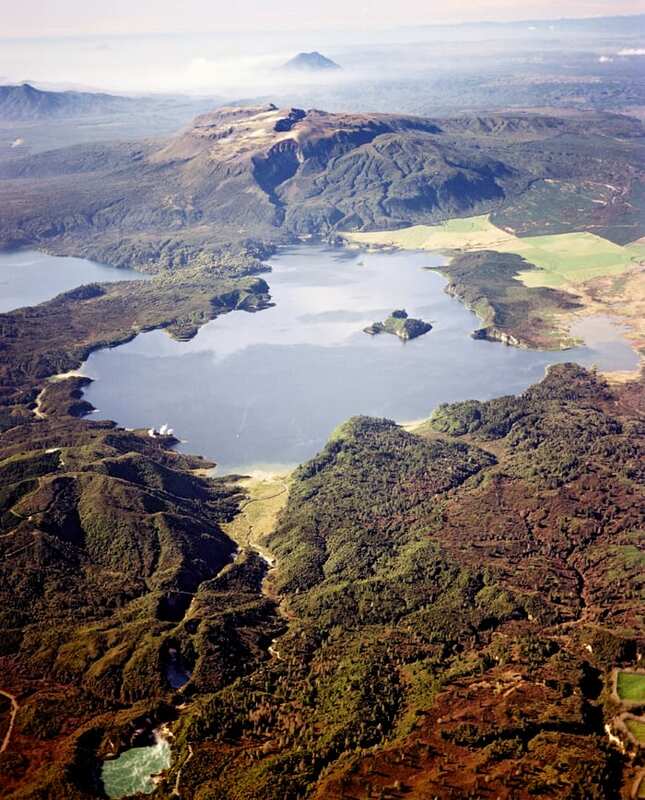 Today’s Lake Rotomahana is about five times bigger and up to 12 times deeper than the pre-eruption lake. Its shores are once again thick with forest, and signs of geothermal activity persist: Geysers and fumaroles dot the western shore, gas bubbles rise to the surface in several parts of the lake, and warm water occurs in numerous locations. The world’s newest geothermal field, Waimungu, has arisen at the southwest end of the lake. 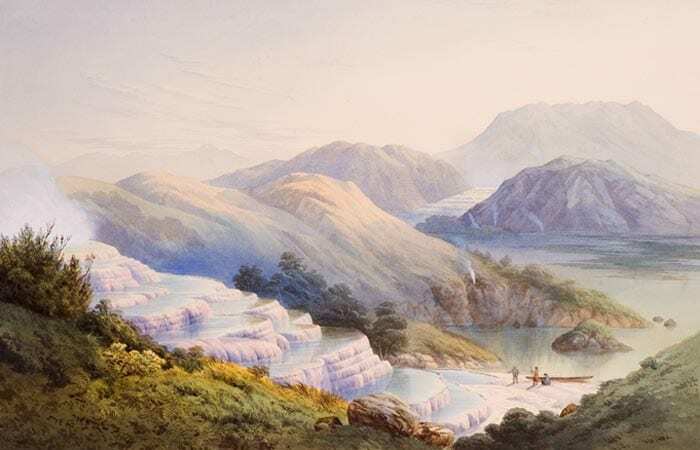 Although he grew up hearing tales of the Pink and White Terraces, de Ronde’s primary reason for going to Lake Roto­mahana was scientific, not cultural. 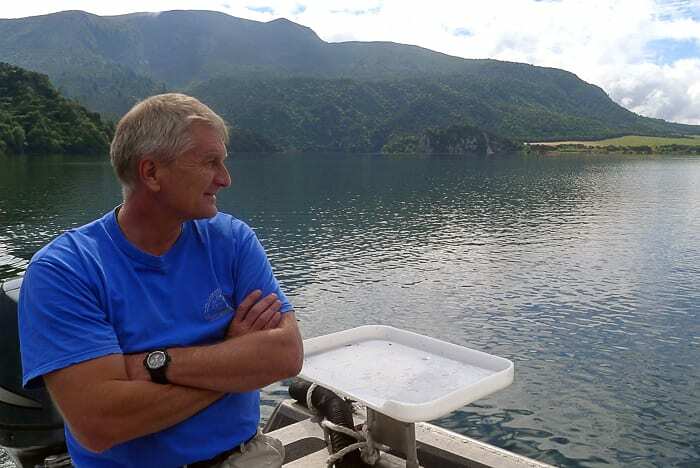 He wanted to investigate the lake because the terraces are among the few examples in the world of an above-water geothermal system that has been drowned, and the only one for which scientists have an exact timeline of its disappearance. He had studied other volcanic geothermal systems, but those were at the bottom of the Pacific Ocean. 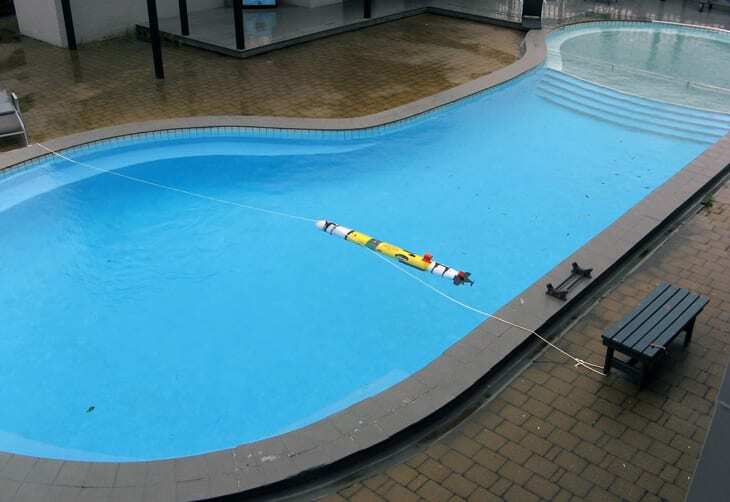 On a survey of the Brothers Volcano on the seafloor northeast of New Zealand in 2007, he had worked with WHOI scientist Dana Yoerger, using a WHOI deep-sea autonomous underwater vehicle, or AUV. 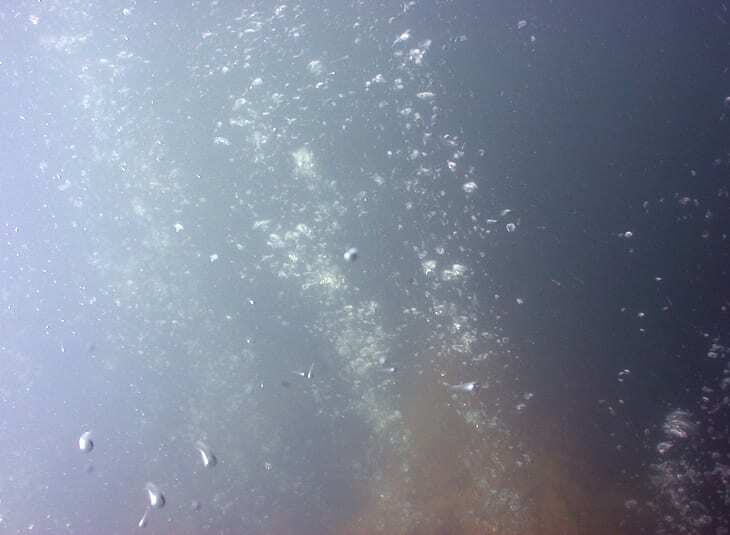 Two years later, on an expedition to the Kermadec Arc seamounts, he collaborated with Fornari, a marine geologist with decades of experience studying seafloor volcanism and undersea “hot springs” called hydrothermal vents. 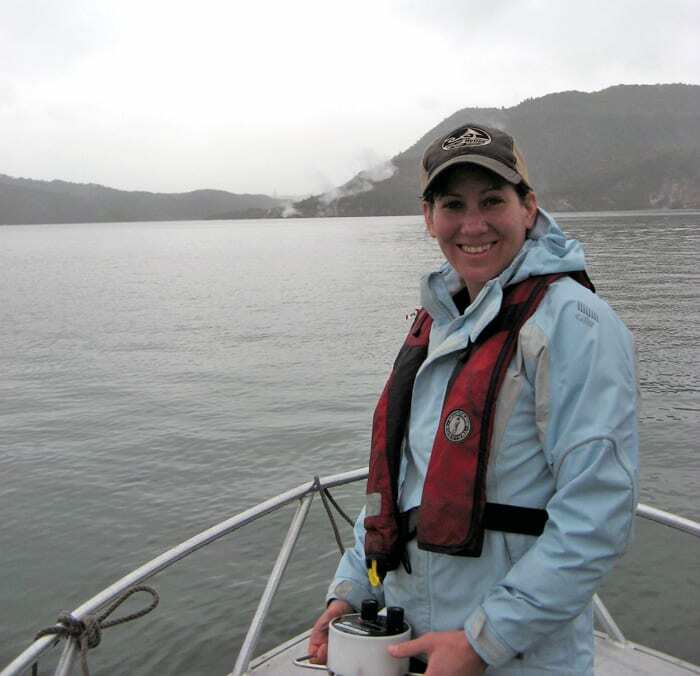 A conversation with Fornari on that cruise led to a collaboration to explore the geothermal system in the lake. Finding the terraces was never part of the official plan. “If you go to a government funding agency and say, ‘We’re going to look for something that 99.9 percent of people thought was gone,’ you would have no chance of getting the money,” de Ronde said. “I also didn’t want to get people’s expectations up, because to be honest, given what had been written, I wasn’t overly confident that we would find anything. So in January 2011, Fornari, Littlefield, and Kukulya flew to New Zealand, joining Sharon Walker of the U.S. National Oceanographic and Atmospheric Administration, Vicki Ferrini of the Lamont-Doherty Earth Observatory in New York, and de Ronde and other researchers from New Zealand’s GNS Science agency and the University of Waikato. 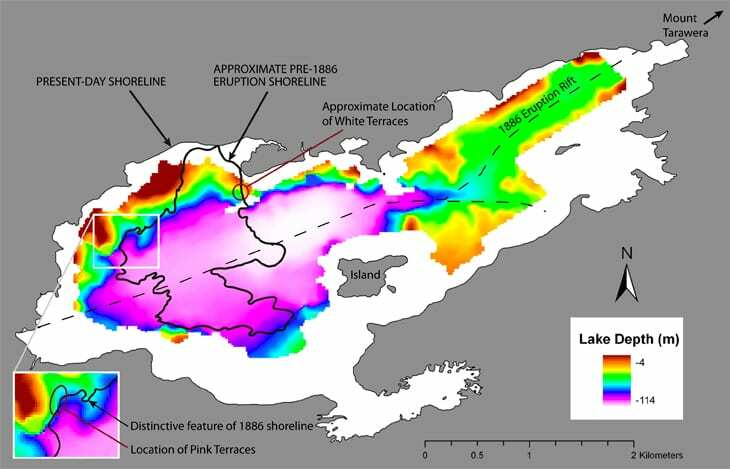 Their goals were to map the lake floor and search for signs of hydrothermal features in its water. Before starting out, the researchers went through a welcoming ceremony offered by Te Arawa elders that reinforced the deep spiritual value the lake and terraces held for them. Elders of the Te Awara also went with them to the lake on the first day to offer a blessing on the endeavor. Torrential rain during the ceremony was considered a good sign for the project’s outcome. Lake Rotomahana is still very isolated; to get there each day from their motel, the researchers drove 15 minutes on a highway, then 15 minutes on a paved road through pastureland, then nearly 20 minutes on a four-wheel-drive road, finally reaching a put-in point just large enough for one vehicle to back the boat it was towing into the water. The researchers’ ambitious project plan had to be completed in just nine days, after fierce storms delayed their start. They would use two AUVs called Remote Environmental Monitoring UnitS, or REMUS, slim robotic vehicles originally developed at WHOI to survey the seafloor in shallow coastal areas. They are powered by battery-driven propellers, steered by fins, and guided by an onboard computer. They have a long track record in ocean work, but they had rarely been deployed in lakes and never been used to survey hydrothermal features. On this project, the REMUS vehicles carried a typical payload of multibeam and sidescan sonars. They also were equipped with instruments never mounted on them before: pH sensors; a magnetometer to detect magnetic field properties that could indicate past hydrothermal activity; and a MAPR (Miniature Autonomous Plume Recorder) from NOAA, which measured a host of water characteristics that could help locate hydrothermal features. 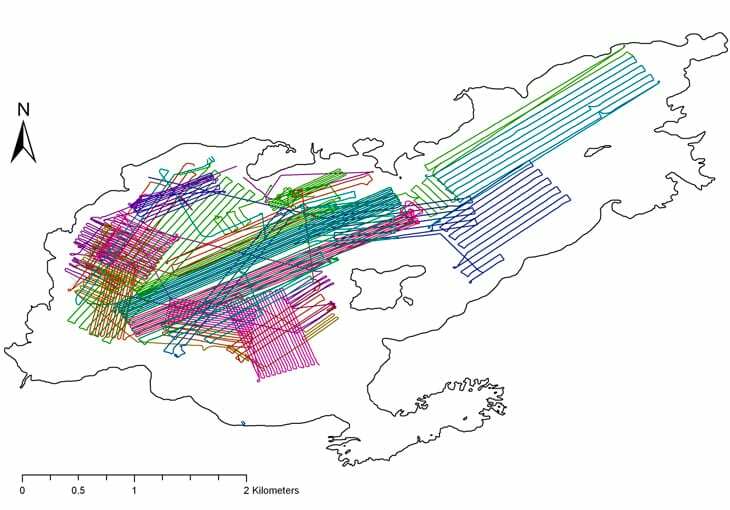 The team ran the REMUS vehicles on grid patterns back and forth across the lake using the multibeam sonar to map the floor. At the same time, the MAPR’s chemical sensors took readings of depth, temperature, salinity, and turbidity of the water. They had hoped to identify lake-bottom features as small as 1 meter but because of technical difficulties, they could get to a spatial resolution of only 15 meters. That was still a huge improvement over the previous map, done in 1975, whose 200-meter resolution would not have shown the terraces even if they weren’t covered by mud. Running out of time and with the multibeam not working as well as they’d hoped, the team sent a REMUS close to the lake’s shoreline where de Ronde thought the Pinks should be, if they had survived. That vehicle used sidescan sonar, which detects sound reflections from hard objects on the lake floor. They also sent down a camera system Fornari usually deploys from a ship. At first, since they had not yet seen the multibeam map or sidescan images, they made an educated guess about where best to deploy the camera. Later, they focused on highlights found by the sidescan. At the motel that evening, they began piecing together information from all their instruments. Hoping that some of the former shoreline would still be recognizable under water, the researchers pored over old photos, paintings, and maps of the lake looking for features that might match up with the contours on their new map. There wasn’t much to go on. It was “bingo!” again when Ferrini analyzed the sidescan images. In exactly the right place were curved structures that looked like the scalloped front edge of a terrace. Just north of them was a ramp angling upward, which the team thinks could be the rest of the Pink Terraces, still covered by mud. Their excitement building, Fornari downloaded photos from the same area taken by his underwater camera—and there they were, the buttresses of several terraces, complete with the “candle wax” texture on their outer faces. They were even pink. Other photos showed ripples on the nearby lake floor, indicating a current. So at least some of the Pink Terraces are still there, and, apparently, intact. De Ronde thinks they survived because they were far enough from the rift not to get blown to bits or collapse into it. A follow-up study in 2012 confirmed that (see Postscript below). “The terraces were never destroyed,” he said. “They never went anywhere. What happened to them is that they got completely and utterly covered in up to 10 meters of thick mud, which was all excavated out of the old lake.” And then, when the waters rose, they and their muddy cloak disappeared from view entirely. The team found the boundaries of the old geothermal system from their magnetic survey and established that it is still active under the lake. They also found a huge geothermal system in the southern part of the lake that had formed since the eruption. The geologists even turned up evidence that is generating buzz among biologists—photos of sponges on the lake floor that resemble a species that lived in the much shallower, pre-eruption lake. Where they came from and whether they are a new species or the same species that adapted quickly to the new habitat are questions waiting to be addressed. Old photos and paintings of the Whites area after the eruption show a rocky hill next to it, dubbed the Pinnacle. During their initial survey, the researchers found the submerged Pinnacle the hard way: A REMUS ran into it. The vehicle wasn’t hurt, but the team steered clear of the obstacle after that—which prevented them from mapping the likely site of the White Terraces. On their last day on the lake, they did a few sidescan runs as close to the area as they dared to go, and then it was time to pack up and head home. Analysis of those sonar images would have to wait. A few months later, de Ronde got an e-mail from an excited Vicki Ferrini. She had finally looked at the sonar images, and at the very edge of the area they surveyed near the Pinnacle were a couple of structures that looked like terraces. The features were in just the right place to be part of the White Terraces, but without sonar of the whole area, the scientists couldn’t be sure. The White Terraces were closer to the rift than the Pinks and may have been severely damaged. The team publicly announced the find on June 10, 2011, the 125th anniversary of the eruption. In the meantime, the expedition had taken on deep personal significance for de Ronde. While on the lake one day, he got a call from his partner: She was pregnant with their first child. The couple asked a Te Arawa spiritual leader to suggest two middle names, one for a boy and one for a girl. In October, they welcomed a daughter, Scarlett Otukapuarangi de Ronde. Many of the people who heard the presentation were moved to tears. Fornari, who has worked on research vessels all over the world, said he has never experienced such a deeply personal response to his work. In February 2012, de Ronde went back to Lake Rotomahana with a new team and additional equipment. 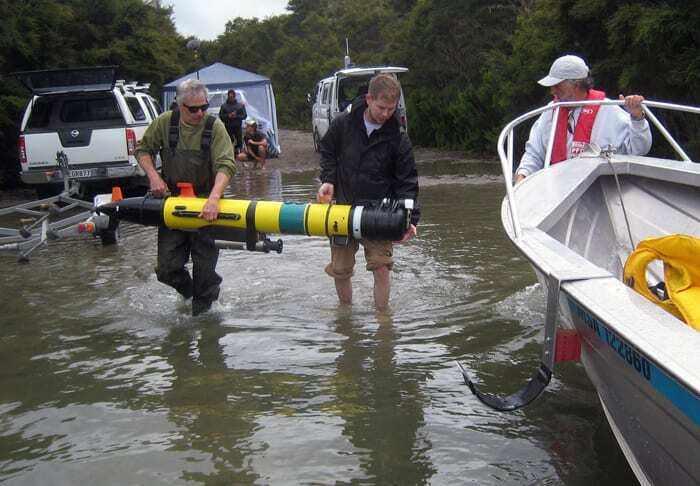 With boat-mounted multibeam sonar, the researchers mapped the lake floor in greater detail than ever before. 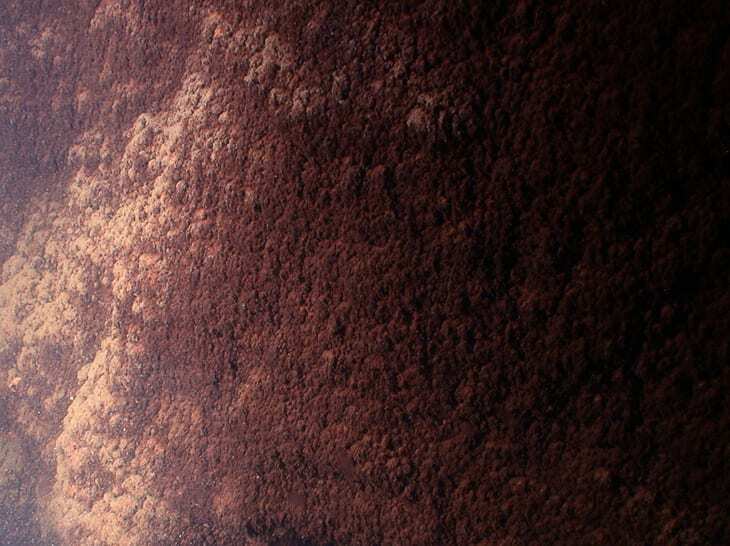 At a spatial resolution of less than 1 meter, the new map revealed explosion craters, the smooth, steep walls of the rift, slumping on submerged slopes, and other features of the drowned landscape. With seismic “boomers” that used sound to penetrate deep into the sediments to detect structures beneath the lake floor, the team found stacks of reflective (hard) features in the ramp-like area near the pink buttresses found in the 2011 study. De Ronde said the new findings confirmed that at least some of the Pink Terraces were still there, under the mud. Seismic images from the likely site of the White Terraces were less definitive, suggesting the Whites may have been more severely damaged by the eruption of Mount Tarawera.